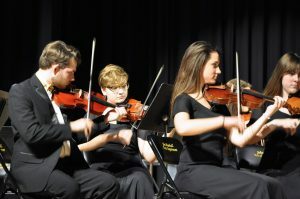 From left: JMHS Strings students Tyler Kreitzer, Madi Blake, Kori Blake and Savannah Weaver. The Marshall County Strings Program will present its annual spring concert on Tuesday, May 1, 2018 at 6:30 pm in the John Marshall High School Center for Performing Arts. The concert will showcase music about water. Concert selections include familiar songs such as the fiddle tune Cripple Creek and Banana Boat Song performed by elementary school students. Middle school students will share three selections including the notorious folk song, The Water Is Wide. High school selections include Bedřich Smetana’s The Moldau and Variations on A Well-Known Sea Chantey. 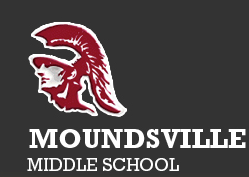 The concert will culminate with a mass orchestra of all students in grades 4-12 performing Smoke on the Water. Additionally, the strings program will present a donation to the Kingwood High School Orchestra which was affected by Hurricane Harvey last summer. The program’s first-ever scholarship will be given at the concert to a graduating senior. These presentations are made possible with funds collected at the Marshall County Strings benefit concert in February.